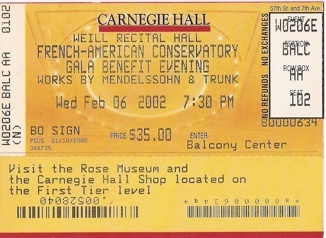 In 2000 Jean Pierre Schmitt, director of the French American Conservatory (http://www.fasmusic.org/) and the French American Orchestra asked her to compose a piece for orchestra and piano jazz trio to be performed at the 10th anniversary Gala concert of the School. The piece Paysages Mouvants (Moving Landscapes), debuted to an enthusiastic audience in Florence Gould Hall at the New York French Institute Alliance Française. March 19th, 2000. The Florence Gould Foundation then commissioned her to create another orchestral piece: Ombres et Miroirs (Shadows and Reflections), for strings, piano and percussion, premiered February 6th, 2002 at Weill Recital Hall, Carnegie Hall, New York. A new piece ordered by Jean Pierre Schmitt, director of the French American Conservatory and the French American Orchestra in New York, ESPERA, a Ballad for alto saxophone and chamber orchestra was performed with saxophonist Javier Oviedo (www.ovittmusic.com) @ St Peter Church in New York on November 5th 2010. ESPERA, Ballade for Alto Saxophone and Orchestra represents the first time I compose a piece that does not include myself at the piano. Incidentally I began writing it with a broken wrist and later on that year (2009) broke a tendon in my right hand!… Other circumstances such as the economic crisis in Barcelona have contributed to the tone of ESPERA. This Spanish word means “wait” or waiting, my first title was “Attente” which is the French equivalent, but “Espera” expands on that meaning as the verb “esperar” also means “to hope”. I wanted that note of hope in the title of this ballad taking us through different shades of colors, lights and shadows. I wrote the first notes in the wee hours of the morning and it is where the piece starts, making its way towards daybreak, daylight and moving on to increasing activity and rhythmic energy. It travels from a more classical sound to a jazzy dance but a yearning persists throughout the journey of the saxophone, which ends up returning to its first lament, waiting for more….